As part of AWS re:Start, Amazon Web Services are hosting a free taster day on Wednesday 28th March 2018 at the Amazon offices in London. Discuss the programme with the AWS re:Start team in as much detail as you need. This is an opportunity for you to decide if AWS re:Start might be the right programme for you launch your career in the cloud. 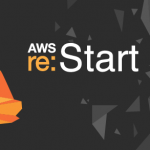 If you’d like to like to attend the AWS re:Start Taster Day, click here or contact the AWS team directly at awsre-start@amazon.com . Please include your full name, email address and contact number.